Erika has completed the CVA (Animal Behavior College certification test). She joined AEC in 2016 as a veterinary assistant. Erika gained interest in the veterinary field after originally starting as a kennel attendant at a pet store in 2008. From there she moved on to general practice where she began training as a Veterinary Assistant. She also worked in the kennel and reception for doggie daycare. 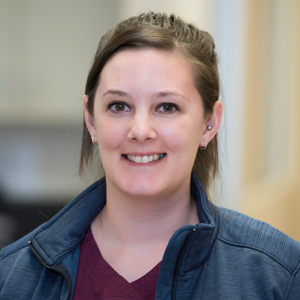 Erika has experience with animal rehabilitation as well as assisting with laser therapy. Most of her training was focused on assisting with surgery. Erika loves working with animals, "I enjoy being an assistant because everyday I learn something new - especially in the emergency world. I get satisfaction knowing that I made someone's day better or easier, whether it be my coworkers, one of the pets I am working with, or their owner." Erika is married with two children and two cats. She enjoys spending time with her family and friends but hopes to continue to learn more in the Veterinary field.